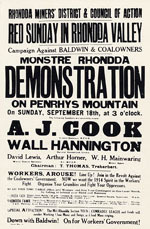 On the 18th September 1927, a demonstration, ‘Red Sunday in Rhondda Valley’, organised by a Council of Action, the Rhondda District of the South Wales Miners’ Federation (SWMF), and the National Unemployed Workers’ (Committee) Movement (NUW(C)M), took place on Penrhys Mountain. A J Cook spoke and called for a march to London on the 8th November to coincide with the opening of Parliament. Each lodge selected miners to march. 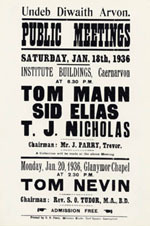 By the time November came, the march had lost support from the Executive Committee of the SWMF and its districts (except Rhondda), partly because of opposition from the TUC. It was however supported by the Communist Party, A J Cook and S O Davies. Numbering 270 marchers, the march drew support from the Trades Councils in every town it passed. The TUC, the press and the Government however, generated hostility against the march. Although the 1927 Hunger March had generated hope in the valleys, by 1928, depression had set in again. Between 1928-9, many young people went to London to find work. On the 5th September 1931, there was a Hunger March to the TUC offices in Bristol, under the slogan ‘Struggle or Starve’. 112 people took part, including 12 women, with a third of the marchers from Rhondda. The march was broken up in Bristol by mounted police and the TUC refused to listen to the deputation. On the 14th October 1932, a nationwide Hunger March set off to London. 2500 marchers from all over Britain took part including 375 from South Wales. They presented a petition to Parliament on the 1st November demonstrating against the abolition of the Means Test and Anomalies Act and cuts in social services, and the 10% unemployment benefit cuts. The authorities were so concerned about the marchers that they were met by the Metropolitan Police in London. Informers kept details of the marchers’ movements. On the 30th August 1933, an All Monmouthshire March of 500 unemployed people marched on the County Council Offices in Newport. They carried a petition with 17,000 signatures with various demands including that the Public Assistance Committees ignore Means Test regulations and grant full benefits to all claimants, and that the seven hour working day be reintroduced for miners. The towns and villages the march passed through gave support and a demonstration involving 20,000 people took place in Newport. Newport County Council however, conceded to only two demands; that they saw the march’s deputation and allowed free transport home. In 1934, the Unemployment Insurance Bill, which replaced the local Public Assistance Committees with the Unemployment Assistance Board, came into force. This meant that rates were set at a national level and could not be influenced locally. In February 1934, a nationwide Hunger March took place, protesting against this bill. Organised by the NUWM and various United Front organisations, it consisted of 17 regional contingences from all over Britain. Marchers were elected from a wide range of bodies including trade union branches and unemployed branches. There were marchers from councils and committees from most valleys of the South Wales coalfield . The march culminated in a congress in London on 24th February and again on the 4th March. Once more informers and the Metropolitan Police were out in force in London. It was the first time since 1927 that numerous SWMF lodges had sponsored the march (12 in all), and also that a miners’ sponsored MP, Aneurin Bevan, supported the march. In 1936, the amended code of Regulations was due to come into force, and once more people protested against it, with large demonstrations in Rhondda. 60,000 people met on the 20th July, and on the 27th July, 100,000 people met in Rhondda and 50,000 people in Aberdare. The Spanish Civil War, which had broken out on the weekend of 18th-19th July, was referred to at these demonstrations. The last and most representative Hunger March to leave South Wales took place in October 1936 with 504 marchers. The march received the official backing of the SWMF and Labour Party, with religious and civic bodies also showing support. Emphasis was placed on this wide range of support, and as a result there was no harassment form the Metropolitan Police or the Home Office, although informers were used again. Hannington, Wal. Unemployed Struggles 1919-1936. (London, 1977). Kingsford, Peter. The Hunger Marchers in Britain 1920-1939. (London, 1982). Stevenson, John and Cook, Chris. Britain in the Depression, Society and Politics, 1929-1939. (New York, 1994).